Professor Michael Mahoney, after whom the Mahoney Toadlet was named, has met with Kangy Angy residents in a last ditch attempt to stop the rail maintenance facility from being built at Kangy Angy. The NSW Government has stated that it will not change its mind about building the facility at Kangy Angy on floodprone land that it was offered by Wyong Council and sold by Administrator, Ian Reynolds. Clr Greenaway said she is not yet ready to give up the fight. “Whenever you are opposing something, you have to have some hope, otherwise you give up,” Clr Greenaway said. “So, given the location, the sensitivity of the land, given that it is flood prone, and given that there is an option of Warnervale, we remain hopeful that Transport for NSW will come back to Council,” she said. Clr Greenaway said that Professor Mahoney had commented during his visit that the amount of fill required to build the maintenance facility would alter the entire hydrology of the Ourimbah Creek floodplain. She said she agreed with the assessment that the flood risk to residential areas downstream of the facility, towards Chittaway Bay, could be increased. “Potentially, I think the risk could be increased upstream, along Ourimbah Creek as well, because depending on how Ourimbah Creek could flow, it could cause some sort of obstruction,” Clr Greenaway said. “I am not a hydrologist or an engineer, but when you put fill somewhere, you change the watercourse, and I am not saying just downstream, it could also cause problems with water banking up upstream, and I just want to flag that as a potential issue. “If you are going to elevate the level of ground, it is just logical that the water is going to go somewhere. “I know the Government says it puts freeways in and redirects water, but this is a low-lying flood prone area, and to me, that is potentially an issue,” she said. Professor Mahoney met members of the Kangy Angy Residents Action Group (KARAG) at the site of the maintenance facility on Friday, December 1. He said a Transport for NSW consultant had detected the presence of the Mahoney Toadlet within the site, during his first survey. 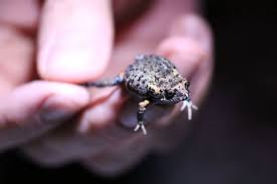 The Toadlet is 20mm long, and now that it is known to live on the floodplain, Professor Mahoney said that it is worth protecting. Another endangered frog, the Wallam Froglet, is also known to live on the site. Both are protected by NSW and Commonwealth laws. Transport for NSW are planning to obtain offset land with similar habitat as compensation for the loss of the Kangy Angy habitat, but the chances of them finding habitat with the frogs is almost zero, so the building of the rail facility will mean the loss of the froglet and toadlet. Professor Mahoney’s parting words to the Kangy Angy residents were: “Save my frog”.